The increase of aquatic feed production is facing the challenge of rising cost and decreasing availability of feed ingredients, such as fishmeal (Barry, 2004). Feed cost usually accounts for more than 50% of aquaculture production cost. Therefore, it is important to find alternative feed ingredients to substitute fishmeal to support sustainable aquaculture. In the Pacific islands, aquaculture relies heavily on imported feeds, which account for the major costs of aquaculture. The rising costs of transportation and the unstable supplies of imported ingredients and feeds can threaten the security of the local aquaculture industry. On the other hand, food waste is one of the major components in landfill and could cause environmental pollution if not properly treated. Consequently, assuming that for resource-limited island communities converting food waste into feed ingredients will provide local feed industry is a viable alternative. 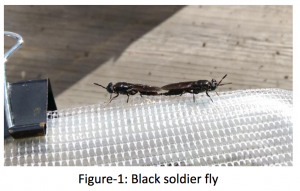 Black soldier fly (BSF; Figure-1), Hermetia illucens, is a short life span widespread insect in subtropical and tropical region; its larvae can grow efficiently on composting household food scraps and agriculture waste products (Tomberlin & Sheppard, 2002). 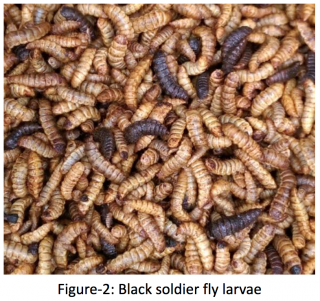 Utilization of Black Soldier Fly Larvae (BSFL; Figure-2) to recycle food waste does not compete for other natural resources. Adult fly will lose their mouth structure that makes it stop consuming food, which makes it focus on mating. Unique structure of antimicrobial peptides found on BSF and BSFL makes it clean and will not contaminate human food source or transmit pathogens (Park & Yoe, 2017; Elhag 2017). BSFL has high contents of protein and lipid and has been shown to be a promising feed ingredient for poultry and aquaculture production (Sealey & Gaylord et al., 2011). Our goal is to produce BSFL as a feed ingredient on the utilization of BSFL in tropical fish or shrimp diets. The experiment was conducted at Oceanic Institute, an affiliate of Hawaii Pacific University. Mature wild female BSF with fertilized eggs (300 – 600 eggs) was attracted by a specific odor during daylight with a special formula. Optimal mating condition was observed under a unique environmental factor. Adult fly will die after mating. Female BSF will lay eggs in small slots that close to the source of the odor, but not directly on the food waste, which is very different from common housefly. Eggs will hatch after three to four days of incubation depends on the environment temperature. BSFL were fed with two different food sources, one with fruits and vegetables household food waste (FV) and the other with grounded poultry commercial corn feed. BSFL were collected at two different life stages: white-color larvae and black-color pupae. The samples collected were freeze-dried and then ground with a grinder. Crude protein, crude lipid, fatty acids, moisture and ash content for the different feed treatments and BSFL stages were determined following the procedures of the Association of Official Analytical Chemists (AOAC, 2000). The test results showed that crude protein content in our collected BSFL was affected by different life stages (Table 1). The crude protein content was higher for larvae-white stage than pupae-black stage in the both food source treatments (P < 0.05). BSFL’s crude lipids content was also affected by different life stages and different food sources. 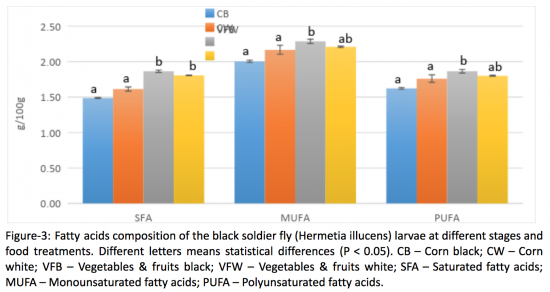 The crude lipids content was higher in pupae-black stage than larvae-white stage for the both food source treatments. The crude lipids content in BSFL from larvae-white stage was higher by feeding corn than by feeding vegetables and fruits (P < 0.05). However, there was non-significant differences in crude lipids content between culture stages or different food sources. Saturated fatty acids (SFA) in BSFL were affected by different food sources (Figure-3). Feeding vegetables and fruits presented higher SFA, than feeding corn. Monounsaturated fatty acids (MUFA) and polyunsaturated fatty acids (PUFA) in BSFL were also affected by different food sources. Highly unsaturated long-chain fatty acids (HUFA) were not detected in the BSFL samples. Summary: Different food sources and life stages affected the proximate nutrient contents and fatty acids composition of the BSFL. The results on proximate contents and fatty acids composition indicate that BSFL meal has the potential to be used in aquaculture feeds to partially replace high-cost marine-based ingredients.